Val, our knowledgeable and vastly experienced Somerset smallholding friend, emailed me to say, amongst other things, that she was sorry if she’d put me off writing "Goats: Part 2" by being outspoken about tethering goats. In fact, the only reason I haven’t written Part 2, is that we’ve been immensely busy with our goats (plural, as we’ve added two more) and there’ll be Parts 3 and 4, the rate we’re going. So, Goats: Part 2 it is then … I told you that we’d put the vasectomised ram lamb in with the pygmy billy goat (billy pygmy goat?) for company, which still left us with some accommodation quandaries. The ram is in the field with the three pregnant ewes and it’s high time (as advised by Val) that he was out of their way so that they can eat their concentrates in peace and won’t be barged about in their delicate state. He’ll also need company but the ram lamb is currently in with the goat, where he is exhibiting quite goat-like behaviour, bouncing up and down Pallet Mountain and enthusiastically tucking into the brambles I cut and throw in for the goat. The problem with being near brambles, if you have a thick woollen coat on, is that they hook on and I arrived recently to find pandemonium: the ram lamb running in large circles whilst a bemused billy goat looked on. We need to imagine ourselves within the minds of the respective beasts to understand what was going on in their goaty / sheepy worlds. Of all the animals we’ve had here, the sheep are the most nervous and flighty. Hooked by a bramble branch caught in his coat, he was towing around what appeared to be a complete hedge, which I guess he imagined as some sort of chasing beast, always just on his shoulder and the only sheepy response to which was to run and then run some more. The goat however, is viewing the same bramble hedge as diner, a somewhat mobile dinner, “Meals on Wheels” perhaps, which never slowed down enough for him to eat it. It’s at moments like these that our inexperience shows. 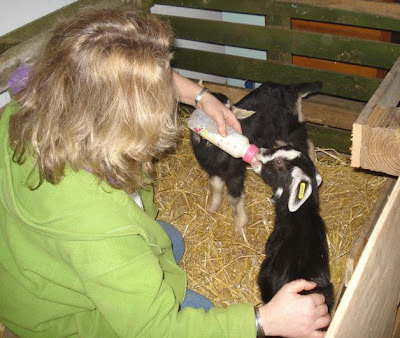 Now add into the mix two beautiful bonny young goats born only last Monday which are currently in a pallet corral in our downstairs hallway (see photo at top) and being fed by us on the bottle four times a day. On their first excursion out, we tried them with the billy goat (see video below) who initially seemed quite happy to have company but, after he’d completed the essential sniffing of nether parts, he wanted to square up to the little male and mount the little female. It was amusing to see the little male, just two weeks old, facing off the billy, rather than running for cover but clearly we couldn’t leave them in with him. So we tried them with the three ewes and all seems to be well. 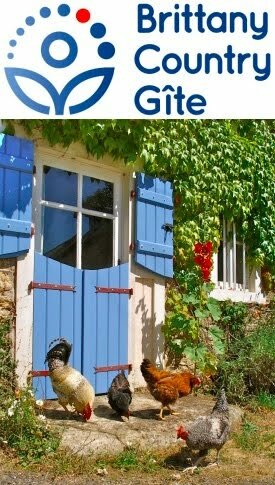 I would have typed this yesterday but, right at the end of a very long day, as Gabrielle was shutting up the chickens in the chicken house, she announced that Mrs Bantam had gone broody. The significance was that she was now blocking up the nestbox where all the hens conveniently lay their eggs; the nursery hutch has Mrs Silky with three chicks in it and the Chicken Tractor now has three growing rabbits in it. Instead of typing this blog accompanied by a glass of cidre artisanale, I helped Gabrielle clean up and repair a wooden rabbit hutch we’d been given by Caroline and Alastair, then install Mrs Bantam, adding another three eggs; if she’s going to all the effort, we might as well make the most of it. I noticed you are putting your kids outdoors.........be careful, when kids and lambs are bottle reared its best not to put them on grass!!! Reason.........when they are with mum they suckle very frequently in small amounts, therefore as the milk stomach which is the largest at birth, gets smaller and the rumen develops as they nibble grass etc there is a balance of 'good bugs' and as they suckle less and consume more the rumen grows and the other stomach (abomasum I think its called?) gets smaller. The vital change over comes at about 4 weeks old. However bottle fed kids get 4 then 3 large feeds of milk per day and at 4 weeks will be having about 2 litres of milk a day in 3 feeds.........add grass and disaster will follow. The grass being a 'wet' feed will react with that amount of milk and cause a digestive problem that can possibly be fatal. The best thing to do is to keep kids in a pen, stable or shed with a concrete yard with as much very good hay as they will eat offered from a couple of days old. Also at a week start offering a goat coarse mix not a sheep mix as goats must have copper in their diet whilst sheep must not!! Keep ad lib feeding of goat mix, hay and milk until kids are about 4 monthe by which time they will have gone down to a small bottle of milk, about 1 pint, morning and evening and will be eating lots of hay. Now start letting them graze for an hour or 2 and gradually increase it until they spend all day grazing and come in at night, keep giving a bottle of milk until 5 months then stop. Always feed coarse mix to goats am and pm and always let them have add lib hay at night all year round. By doing this you will have a top notch goat with a good rumen, capable of eating vast quantities of bulk foods such as hay, grass, brambles, bread, willow, tree branches etc who will milk better than a poorly raised one..........believe me I had some of the best goats in Britain in the early 90s!! Cute cute little goats :-D and congrats on your broody hen. 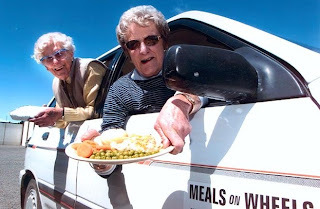 Is that Jeremy Clarkson in a wig in the Meals on Wheels illustration? That video of the goats is just about the cutest thing I have ever seen. It is such a shame they will be all grown up by the time I visit! I'm sure they will still be cute though. I am really looking forward to coming out in the summer. I miss you both, and all the animals!